The Volkswagen Golf was one of the first cars in the tiny hatchback category. Since its debut in Europe in 1974, the golf has gone through a lot of changes. It arrived in the United States one year after its European debut wearing the name “Volkswagen Rabbit.” However, Volkswagen gave this American version the "Golf" name ten years later. This was not permanent, in 2006, after the company had already sold three generations of the Volkswagen Golf, they opted to rename this economy car the VW Rabbit specifically for the United States market. 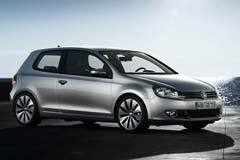 In 2010, Volkswagen changed their minds once again and decided to stick with the original Golf name. Despite all these name changes, one thing you are guaranteed to get if you purchase a used Volkswagen Golf or Rabbit is a stylish boxy hatchback. It has a good combination of comfort, practicality and well refined handling coupled with a very roomy and upscale cabin.